‘Past performance is no guarantee of future performance.’ Like a food label warning that your favourite box of chocolates may contain traces of nuts, we’ve all read something similar when analysing the performance of a fund manager. But this warning also applies to individual stocks. Just because a stock has a stable history, for instance, doesn’t mean its future is assured. Do you remember Allco or Nokia? Each were coveted growth stocks before they were swiftly knocked off their perch. John Malone is the doyen of the US cable TV industry and the lead protagonist in the book Cable Cowboy. 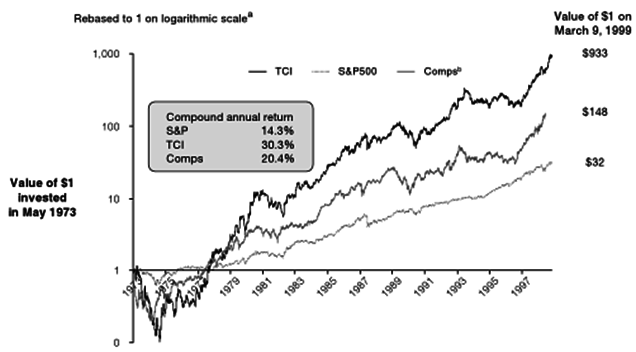 He produced 30% annualised returns as CEO of TCI between 1973 and 1999 (twice that of the S&P500 – see Chart 1) before selling the company at the height of the tech boom to AT&T. We own several Liberty names with businesses diversified by industry and geography. They don’t typically screen well due to a host of factors. Management focuses on maximising free cashflow to buy back shares rather than reporting high current profits that attract high taxes, for example, which depresses return on equity even though the company produces high returns on investment. Paul C. Saville watched the original incarnation of homebuilder NVR go broke before becoming CEO in 2005. Unlike virtually every other listed homebuilder on the planet, he learned from the experience and constructed a way to protect NVR from recessions. Instead of dangerously leveraging the balance sheet to accumulate land for development, NVR lays down 10% of the purchase price for an option on future development. This means the balance sheet isn’t highly geared, allowing the company to buy back 75% of its shares on issue over the past 20 years. That’s a remarkable feat for any company, yet alone a home builder. While its larger rival Alibaba measures delivery times in days, JD.com measures them in hours, usually promising same day delivery if you order before 11am. This incredible feat reflects huge long-term investments in warehouses and delivery fleets, which Alibaba has avoided to keep current profits as high as possible. It also required a culture change in an industry not usually associated with caring much for the state of parcels to be delivered. Over time we expect JD.com’s delivery advantage will allow the company to expand its range of goods and take market share from Alibaba. But it requires Liu’s fortitude to sacrifice profits today for much higher profits tomorrow. This contrasts with typical corporate behaviour, or the ‘institutional imperative’ as Warren Buffett calls it, where executives favour high immediate earnings and share buybacks over long term investments to maximise bonuses at the expense of the long-term health of the business. Inside-owners are often more entrepreneurial, and aren’t afraid to do something different if it makes financial sense. Note NVR’s unique land acquisition strategy, or JD.com’s expensive supply and distribution strategy compared to Alibaba’s preference to outsource its delivery to maximise current profits. According to research by von Lilienfeld-Toal and Ruenz, ‘The acquisition activity of firms with high ownership is significantly lower than that of low ownership firms… Overall, these findings suggest that high ownership firms engage less in empire building’. Nathan Bell is Head of Research at Peters MacGregor Capital Management.